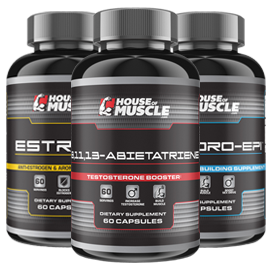 HouseOfMuscle.com and the House Of Muscle line of sports nutrition supplements were founded in 2003 by Joel Sward. "Since the first sale on HouseOfMuscle.com in 2003, my goal has been to build a business that would provide a high quality, effective and low-priced line of sports nutrition supplements. I wanted to provide these supplements in a way that would be truly effective for my customers, and help them achieve their individual goals." The idea of starting the House Of Muscle ® line of sports nutrition supplements began years before the company was actually formed, while Joel was devoting a large part of his adult life to transforming his body into something better than it was when he started. The impetus for this was mostly fueled by his desire to perform well as an athlete. Joel played high school and college football and was a collegiate track and field athlete. He has also competed in bodybuilding, power-lifting and strongman competitions. He learned that training and diet were the cornerstones of any successful attempt to reach his goals, and he also learned that sports nutrition supplementation needed to be part of his plan if he was going to achieve his highest potential. Joel began taking sports nutrition supplements in his teens and he believes supplementation has been a huge part of any success he has had as an athlete as well as any success in transforming his body into more than what it was when he started. This desire to be the best he could possibly be fueled not only years and years of tough workouts and good dieting, but also his desire to not simply take sports nutrition supplements, but to study them and truly understand the potential benefits they could provide. "I wanted to take the best sports nutrition supplements that were available. I wanted them to be of the highest possible quality and I wanted them to be truly effective in helping me achieve my goals. From the knowledge I gained, HouseOfMuscle.com was born. HouseOfMuscle.com became an outlet for me to pass on my knowledge to other people who have similar goals and aspirations that I had and continue to have." Today, HouseOfMuscle.com has over twenty outstanding products, more employees who are also focused on working hard to reach their goals, and they ship all over the world. House Of Muscle ® will continue to grow and is always on the lookout for new products that can help their valued customers reach their true potential. our House Of Muscle ® supplements ready to train hard. We are striving for something. We are working hard to reach our goals. We want to be better than we were when we started. We want to transform our body into something better than what it currently is.